The NAMM Show for 2019 is here and going to be taking over the Anaheim Convention Center for the next few days. While we aren’t going to be in attendance we just had to share this brief on what will be going on with the fine folks at Gibson. Take a look. In 2019, after more than a century, GIBSON artists, players and enthusiasts will experience the all American-made instrument brand rejuvenated. The guitar of choice for artists in rock, pop, country, blues, folk, jazz and beyond, the new GIBSON era celebrates iconic models while looking to the future with instruments that will nurture new players across generations, genders and genres of music. GIBSON will showcase the new line-up and artist collaborations at NAMM in Anaheim, CA, January 23-27. On Wednesday, January 23 the GIBSON experience will launch with a media preview (3:00pm) in the NAMM lobby followed by a special surprise for guests around the 4:45pm hour. Beginning Thursday, January 24, the GIBSON space in Room #207 will feature daily events from artist performances, Q&A’s and new product debuts from GIBSON icons and upstarts (starts 10:00am daily, see schedule below). Later Thursday night (1/24), GIBSON will kick-off their opening party–NAMM Jam at City National Grove of Anaheim (7:30pm) with live performances from Billy Gibbons, Nancy Wilson, Peter Frampton, Robby Krieger, Emily Wolfe, Black Pistol Fire, Cam, Jared James Nichols and more while Jimmy Vivino, Kenny Arnoff, Daryl Jones and Jeff Young round out the house band. As much as I love vacations, the aspect of them seems to have eluded me of late and the closest I seem to get are those little moments of respite that fall outside of the normal scenarios that I often find myself adventuring into. Thanks to my good friend in music media, Christa Titus, the Piercing One would tonight be taking a breather from all of the Heavy Metal indulgence that I had been undertaking. It was needed to say the least and came right after the killer performance by Stratovarius & Pagan’s Mind that was last night over at the Nokia Theater. This brief excursion into “normalcy” would be a perfect lead into the next couple of days since tomorrow I had planned to see Stryper over at The Fillmore NY and if I could maneuver between time efficiently, both the Chris Caffery performance and Gwynbleidd one on the same day the Saturday which followed. This evening’s fun was held at the Gibson Studios and this was a place that I had never been to before so I was rather excited about getting to explore it a little. It was also nice to be the guest of someone else for a change as that seldom happens. The purpose of the event was to deliver a good time and very good music in this Emerging Artist Showcase. There were four bands by my count and among them were Heavy Road, The Shells, Zigmat and Dynasty Electric. 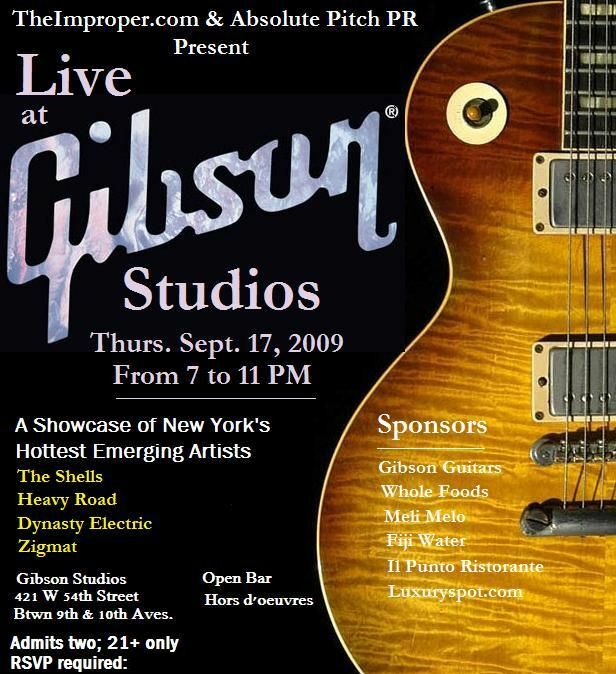 When we walked into the Gibson Studios we learned that the food and beverages were on one side and that the bands were performing in the main studio out in the rooms center. They had some passages of the offices blocked off and that was a little bit of a shame since there were cool guitars hanging up and I would have loved to take a few more photos of them. Here is a view of one of the hallways, sorry I couldn’t get a better angle.